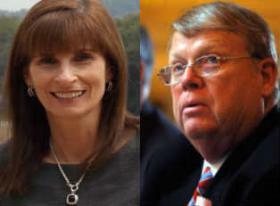 Nine candidates are seeking their party’s nominations for Lieutenant Governor this year. The first in our profile formerly served as state Delegate and state Senator and is one of only two women to run for statewide office during this nominating season, Jeannemarie Davis. The second in this first part of our series is former Army Colonel and long-time Delegate, Scott Lingamfelter. Anne Marie Morgan reports. This entry was posted on May 8, 2013, 1:16 pm and is filed under Candidate Profiles. You can follow any responses to this entry through RSS 2.0. You can leave a response, or trackback from your own site.